Oh here’s another glorious example of geeky glasses. I’m coveting them so badly. I love this photo. She looks so fabulous. (Again) I found it on vi.sualize.us via strawapple on livejournal. Here’s the definition of Geek Chic on Wikipedia. I hope you had a splendid new years celebration. I look forward to getting back to regular posting on Monday as I near my surface pattern tradeshow. I’ll be posting some of my new work. So stay tuned. 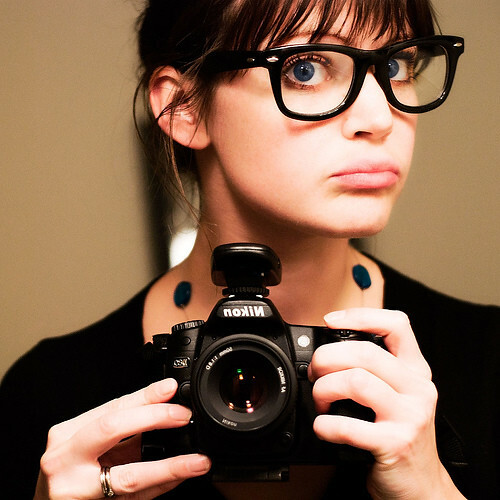 I’ll try to stop posting pictures of girls in glasses, really I will. Maybe just a couple more, but not for a while. Back to art and design, I swear. here she is again….I do love this shot. It’s a good one. Makes me really want glasses. I just flickr mailed you about a project. I hope you are into it! love this. I have been trying to get my hands on a very particular pair of oliver peoples glasses- unsuccessfully. This photos makes me want them worse! Thanks Roberta…I’m kind of in love with glasses these days. I’m sure I’ll post about more soon.